Could your guest room have a vacancy sign posted outside? Guest rooms often remain empty for months of the year even as people are searching for usable space in their homes. Don’t limit your guest room to guests only. It’s in your house and you can use it the 48 – 50 weeks of the year when no guests are in there. Read on for tips to create a multipurpose guest room so you can add function to your home and have a place for visitors. 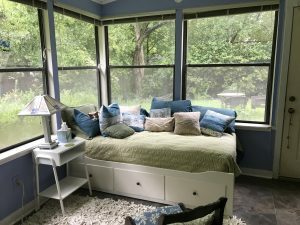 Guests stay in the sunroom on a storage bed that pulls out to make a king mattress. Consider what you wish you had room to do. Maybe it’s a place to process mail and pay bills so that your kitchen counters aren’t full of paper piles. Or, it’s not so much function you need as it is a quiet place to read or meditate. You may be thinking you’d need a bigger house or to wait until kids move out before you can have a craft space, but using the guest room for more than guests could be your solution. How often you have guests and how long they stay can help you decide what to do with your room. For instance, if you have visitors one week out of of every month, you might not want to make the guest room double as your office space because losing access to it that frequently would be a serious inconvenience. However, if you simply need space to store your office supplies and files, the guest room could serve as storage space when you have visitors and work space when no guests are in residence. So, how can your guest room multi-task? Let us count the ways. A murphy bed takes your office to guest room in minutes. Browse more murphy beds on Houzz. You may not need to use the entire guest room for something else. Your guest closet can add much needed function or storage and still store guests’ clothes. Leave some hanging space for guests to use . Instead of a dresser, a canvas hanging bin serves as storage for folded clothes. Now the closet can transform. Crafting and gift wrapping supplies are hidden by curtains when guests come. 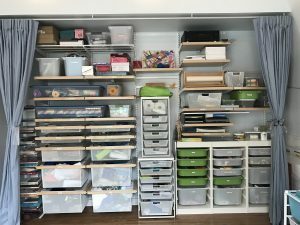 Toy closet or storage for toy rotation bins. Seasonal storage for off-season clothes. Sometimes, just figuring out that you want to do something is all the information you to take a project from start to finish. Others, you need a little help taking vision to reality. If you’d like some help setting up a multipurpose guest room or simply looking at your home to think about how to use your space differently, I can help. You can contact me via email or by phone at 512-591-8129. I’ve never considered making my guest room anything but! Doubling as a craft room sounds very appealing. What an interesting idea. That sunroom is so dreamy! Thanks Kim! Yes, being able to use the room in all the time without guests can feel like a dream. Your guest room would be great for it.